Feasting is also closely related to memory. We eat certain things in a particular way in order to remember who we are. Why else would you eat grits in Madison, New Jersey? My mother and father are awfully manipulative, considerably messed up, highly harmful, terrifyingly tyrannic and disfunctional, but although I have not spoken to those two beings since eight years and I don't regret cutting off all contact with them (the only solution left for me if I wanted to get healthy again, to maintain my sanity as well as to reclaim my independence), certain past events just can't be washed away that easily, especially if they are enjoyable and linked to food - one of my biggest pleasures and weaknesses. I might not have been blessed with selfless, non-narcissic, affectionate and dedicated parents who had a healthy relationship with one another or their children and who were capable of ridding themselves from their demons, yet I have to admit that regardless of all the stuff they have put me through and how much they have hurt me, treated me disrespectfully, caused me to doubt myself, brought me to my knees, supressed my self-confidence, transformed me into a willing "slave", vampirized me and deeply bruised my ego, soul as well as body, I still recall the rare and happy moments when what was left of their kind nature transpired through the thick veil of toxic poisoning that kept them emprisoned in frustration, hate and affliction. Being a person who prefers to dwell on the positive side of things instead of choosing to get galvanized by negative thoughts, I cherish those cheerful and peaceful times and try not to focus on events that caused me a lot of pain and distress even if I know I'll never be able to obliterate them totally from my mind. Their hurtful legacy has marked me for the rest of my existence and there's nothing I can do about that, nonetheless, even if they didn't bring me up conventionally I have to point out that, at least, they have taught me to cultivate a fervor for quality fare and fine dining. This passion later turned into a serious hobby to which I am a 110% dedicated and which I need to survive. I am grateful for this heritage as it has got me through the tough periods in my existence (read article on that subject here). It seems many emotionally handicapped people show their feelings for their kids by feeding them like kings. It is their way of expressing their emotions and thoughts. I guess it is for that reason that eating is often associated with well-being and is quite regressive. In my case, I know that what graced my plate never failed to bring a smile on my face and had the same effect on me as the warm kisses on the cheeks or an affectionate hugs I sadly never received and always dreamt of getting - until today, it is a mystery whether they truly love me or not. For instance, I will always remember coming back home from school to an apartment smelling gorgeously of homemade dishes and freshly baked goods that my mum had been preparing while I was arduously studying. This filled me with joy and lifted my spirits. A breath of fresh air after a hard day of learning in an environment that was quite depressing for the outsider and social misfit that I was. Food transported me to another world and had a strong impact on my mood - it still does nowadays. There was one sweet chow I particularly liked to find on the kitchen table when I got home in the afternoon: "Welsh Cakes", a wonderful speciality which hails from Wales in the UK. I can't think of something more soothing and addictive than those round doughy delights. One little bite of them babies was enough to make me forget my exam stress and the fact that I was singled out by my peers and didn't have many friends. As if by magic, all my problems vanished and I was overwhelmed with pure contentment. A genial hearth, a hospitable board, and a refined rusticity. Unlike other patisserie products, "Welsh Cakes" are never baked in an oven. Actually, they are very shortly cooked on a bakestone, a hot plate or in a heavy metal pan. This humble confection is made from butter (or lard and margarine when it comes to the cheap version), self-raising flour (or plain flour to which baking powder has been added), castor sugar, currants, eggs as well as a little milk and salt. They are a variant of the flat griddle-breads and scones found throughout the western and northern parts of Britain, though they are flatter and a lot denser in mass and texture than the latter. In the past, "Pice Ar Y Maen" (Welsh for "cake on the stone", also called "Cacennau Cri") were fried in a cast-iron skillet or in a kind of Dutch oven (three-sided tin oven) placed in front of the flames of the kitchen fire. At this time, yeast was used as the raising agent as baking powder appeared only after the mid 19th century. Each family prepared them slightly differently and had their own secret formula which was passed from down to daughters (some included honey, mace, cinnamon, nutmeg, currants or even ginger). 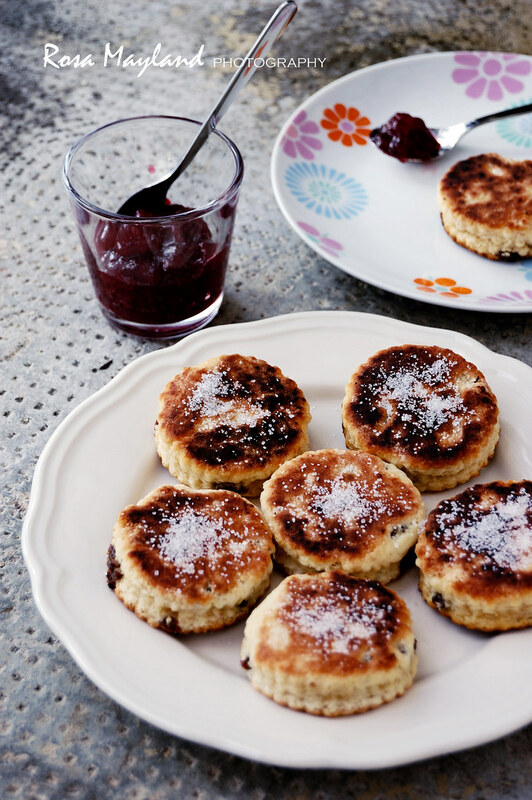 "Welsh Cakes" are lusciously soft and humid on the inside, delightfully crispy on the outside and have a nice chewy touch thanks to the moistened dried fruits. It is recommended to eat them while they are fresh and still warm as it is then that they are at their best. Unless you have tasted that artisan deliciousness, you'll never be able to imagine how fabulous it is or to understand why the Welsh folk venerate this afternoon tea delicacy so much as it is quite incomparable. As a matter of fact they are absolutely irresistible, incredibly ambrosial, gustatively fullfilling and so moreish in a manner only warm pastries can be. It is impossible not to stuff your face with them and end up exploding after having giddily swallowed your upteenth "Welsh Cakes" in a row. Once you start, there's no stopping you. The recipe I am presenting today is based on the one that has been followed by both my granny and mama so, as you can imagine, it is very traditional and far from being recent. As a matter of fact, I bet it dates back to the early 50's. Of course, since I am a perfectionist and it is my habit to add my owm personalized touch to things, I fiddled with it in order to ameliorate and customize it a little by ajusting the quantity of milk used as well as by adding a few grams more sea salt and raisins. This combination of homely ingredients and rich flavors is simply perfect. As a result, my "Welsh Cakes" are dangerously hooking and refined despite their modest origins. So, my question is the following: are you strong enough not to fall under their spell? Nah, I bet not and why bother resisting? You know you'd never win that battle!! Recipe by Rosa Mayland, April 2012. Makes about 14-16 Welsh Cakes. 1. Combine the flour, baking powder and salt together. 4. Beat the egg together with the milk. 5. Add this mixture to the one in the bowl and combine in order to obtain a ball of dough. Knead lightly. 6. Roll out the pastry until it is about 5 mm (1/4 inch) thick. 7. Cut into rounds with a 6cm (2.4 inches) fluted cutter and re-roll the trimmings. 8. Fry each pastry rounds in a moderately hot cast-iron pan or frying pan for about 2-3 minutes on each side, or until lightly browned. 9. Let cool on a rack or eat while still warm. 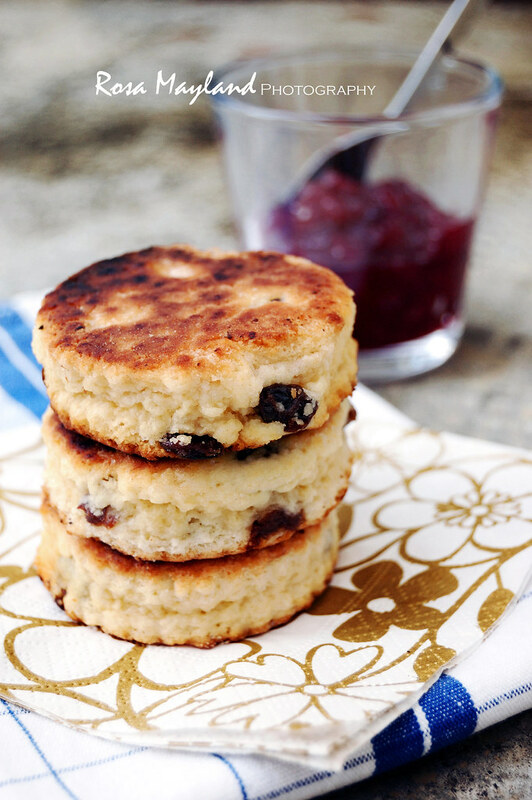 If you want your "Welsh Cakes" to have a spicy edge, then you can add 1/2 tsp mixed spice to the dry ingredients. Serve them warm or cold, plain or dusted with sugar, with butter or clotted cream and jam. Pour environ 14-16 Welsh Cakes. 1. Mélanger la farine, la poudre à lever et le sel ensemble. 2. Ajouter le beurre et sabler du bout des doigts. 3. Incorporer le sucre et les raisins secs. 4. Battre l'oeuf avec le lait. 5. Ajouter le mélange liquide à celui dans le bol et bien incorporer à l'aide d'un couteau afin d'obtenir une boule de pâte. Pétrir très légèrement et rapidement. 6. Etaler la pâte à une épaisseur d'environ 5 mm. 7. Découper des cercles à l'aide d'un emporte-pièce cannelé de 6cm. 8. A feu moyen et dans un peu d'huile (1 CS), faire frire chaque rond de pâte dans une poêle pendant environ 2-3 minutes de chaque côté, ou jusqu'à ce que les cakes soient dorés. 9. Les faire refroidir sur une grille ou les manger lorsqu'ils sont encore chauds. Si vous voulez que vos "Welsh Cakes" aient une saveur épicée, alors je vous recommande d'ajouter 1/2 CC de mixed spice au ingrédients secs (recette: 1 CS cannelle en poudre, 1 CC de coriandre en poudre 1 CC de noix de muscade en poudre, 1/2 CC de gingembre en poudre, 1/4 CC de tout épice en poudre et 1/4 de clous de girofle en poudre). Servir les Welsh cakes encore chaud ou seulement une fois refroidis. Ils peuvent être mangés tels quels ou saupoudrés avec du sucre cristallisé ou encore avec de la confiture et du beurre/de la "clotted cream". Lovely Welch cakes and blossoms. Have a wonderful holiday weekend Rosa! You are correct. Food and memory do go hand in hand together and can transform you back to good memories. It is especially comforting to taste something familiar miles away from home. I made Quark the other day, since it is so hard to come by where I live. Gorgeous pictures like always and I wish I could taste one of your little Welsh cakes with my tea right now. Ça me rappel... mes origines ;) Superbes !! Rosa: what a touching post... you have worded very well a deep truth, that love can be passed on through food. Thanks for sharing! I am so sorry to hear about all the negativity of your parents. But I commend you for focusing and the few positives. Your Welsh cakes sound amazing, I can see why they would be a happy memory. Thanks for sharing these lovely cakes and your story. I hope your achievements in the kitchen will triumph of those dark memories one day. Have a good Easter dear. Ils sont parfaits pour mon goûter avec un peu de miel de pissenlits ! Dear Rosa absolutely nice and touching post sorry about all you lived. I learned (and is hard) nothing is perfect but the important are you HAVE MADE with you Rosa, an amazing and lovely woman that take georgeous pictures, cook fantastic an are a awesome human being, I think you are blessing now that is the important. thanks for shrinag dear,love all your recipes that I know are made with love. happy Easter to you! Love yah! Voir les arbres en fleurs, cela sent le printemps. J'en profite pour te souhaiter de joyeuses Pâques! Tes welsh cakes sont au moins aussi beaux que ceux que j'ai mangés à Caerphilly! Rosa, this was a heart-rendering post. That you came out on the other side of your childhood so well is testament to your strength. It's wonderful you can use happy food memories in your healing and the best thing is you're passing on to us the most wonderful recipes. These look wonderful! Rosa friend like you are our inspiration coz you fight against all odds of life and shallow all pain still share smile,the beauty and taste of life! May you always be blessed! Oh, I could not agree more. My earliest memories are connected to my favorite recipes. Texas cornbread at my school's Kindergarten feast and I my mom's cheese grits remind me of every special holiday family occasion. These cakes are so beautiful! Yum! A cake that worth recognition. This makes me so hungry! They look delicious! ... and I must add this. Even though your parents are harmful and manipulative, you have turned out to be an extremely thoughtful, kind and talented person. This shines through in your writing and even in your photography. Rosa, I was deeply moved reading your childhood memories. Now, thinking back on more or less happy periods of my life, I must say food (and now also wine) memories are always positive and bring a smile on my face. I have never been forced to eat anything I disliked (in general we shared preferences for food in our family, my mum cooked very well and we were rather omnivores), so I have no unpleasant food memories. Welsh cakes not only look gorgeous, but also very original with the pan frying process. I think I will give them a go one day. Thank you for sharing your memories and this wonderful recipe. Despite everything, you turned out to be a lovely, strong, intelligent woman. Plus, you're an inspiration to everyone else. Très très mais alors très gourmands !!! Je suis sûre que j'adorerais ! I admire how you turned bad childhood memories into beauty, with these pastries (and all the others that you create) and your beautiful photography; you have conquered the pain and turned it into beauty and joy. It's good how you don't blame your parents and moved on. You certainly found some light in the dark. Food is memory to me. An aroma i memory - a toothsome bite - and it i beautiful to try and create the good. These were created with such care - it shows. And so they entice. Have a beautiful holiday weekend. I love Welsh Cakes - they were the first thing I ever made on my blog and will always be special to me like they are special to you. Your photos make me crave some so much - delicious! Thank you for sharing such an intimate post, Rosa. I'm saving this recipe link. I've always wanted to try making them and with your guidance, I just may. Good for you to have moved forward and to think of the positives. I can see why these cakes were so memorable. They look delightful! Sadly true, food has been a replacement for love for so many of us I'm afraid. So glad to hear that you were able to separate yourself from a painful past. De délicieuses bouchées gauloises !! I have never had these but your post is certainly making me crave them. Just beautiful! I am moved by reading your post! Your cakes look wonderful... and your photography gorgeous! Thank you for sharing your memories, I wish you a lovely holiday w.e.! It's beautiful Rosa, and the presentation is just WOW! I've never heard of these gâteaux before. They look so good. Happy Easter! Food has such magical powers! I was in Wales recently but I never tried these. Now I really wish that I had - they sound fabulous! Happy Easter! I remember rushing home from school, another day of torture for this misfit, with nuns picking at me all day to smile, smile smile, till my face felt like it was cracking from the effort-- and then. luckily for me, my grandmother's matchless, tender, jelly-hearted molasses cookies would be waiting. I'll try these sometime soon, and tell you how they go over in Buffalo, NY. Food does lift us up Rosa. I know that these Welsh Cakes would make a lasting impression on me. Ah Rosa - have you read Philip Larkin's verse? "They f**k you up, your mum and dad. I suspect it is truer in some cases more than others. Still, these delicious little cakes would be very soothing and healing. Dear Rosa, The thoughts that you shared are very sensitive. I am sorry that your memories are difficult, but I am glad that you have overcome and have learned that you need to take care of yourself. I am glad that you do find the bright spots in your life like these delicious cakes. How sad to not have a good relationship with your parents. These Welsh cakes are new to me but I can see they are a littlelike scones. Ces petits gâteaux qui ressemblent à des scones me plaisent beaucoup. J'adore la première photo du cerisier en fleurs, elle est SUPERBE! Rosa, I think this is one of my favorite posts yet. Your story + the comfort of these beautiful cakes. Those spring blossoms are breath taking. Well done! You are a brave and honest woman. These Welsh cakes look as lovely as those spring blossoms. Rosa, how brave of you to open up your heart and talk about your parents and the damage they did to you. Having children I can't even imagine how someone would hurt them but I also see how easily you can screw them up by being a bad parent. I hope your healing path is still wide and up hill, you are a stronger person because of this. I am also glad that you found healing in cooking, and sharing your passion, you are good at it! Thanks for this recipe, it sounds delicious! I sure know that any of my jams would love the company of those specialty cakes...mummm! Happy Easter my sweet friend. Such an incredibly, beautiful and touching post my friend Rosa. Tears on my face after reading this post, oh lala. You're a great person Rosa! Hapyy Easter et bisous. Hum ça a l'air délicieux! Un peu comme des scones, avec la confiture c'est top! Have a blessed Easter Rosa. I've never had these before-they look so interesting! Hiya Rosa, thank you so much for sharing this heartfelt post about your past. I am so sorry to hear about your relationship with your parents and I can never imagine treating my daughters like that. rosa, i declare that you could make a steaming pile of cow manure look amazing! what lovely pictures of a terrific batch of cakes! They are so beautiful! Just so perfect looking! what a great "story" of life! and a great recipe too!! thanks. I have never heard of Wesls food but we love a lot of peasant food!! 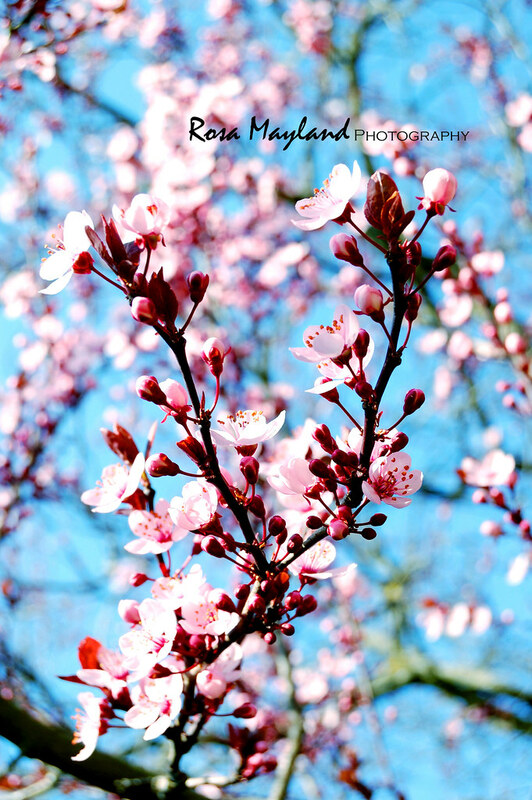 And I really love all of your spring blossom photos. Plus que parfaits avec une bonne tasse de thé noir. These little cakes are so elegant! I'd love a couple along with a cup of tea right now. Gorgeous photos, too! Rosa, reading your posts, I would never known that you had such childhood...you are a beautiful person...this is what you are. 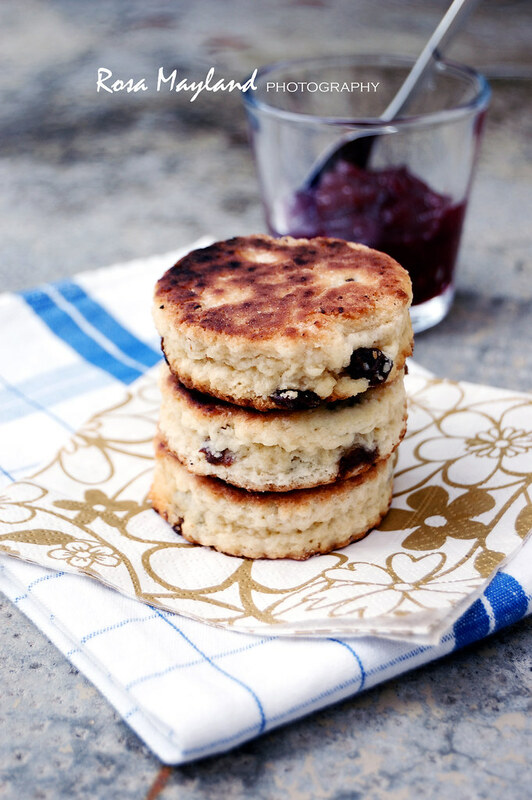 I never heard of Welsh cakes before, they sure look flavorful, great with a cup tea? 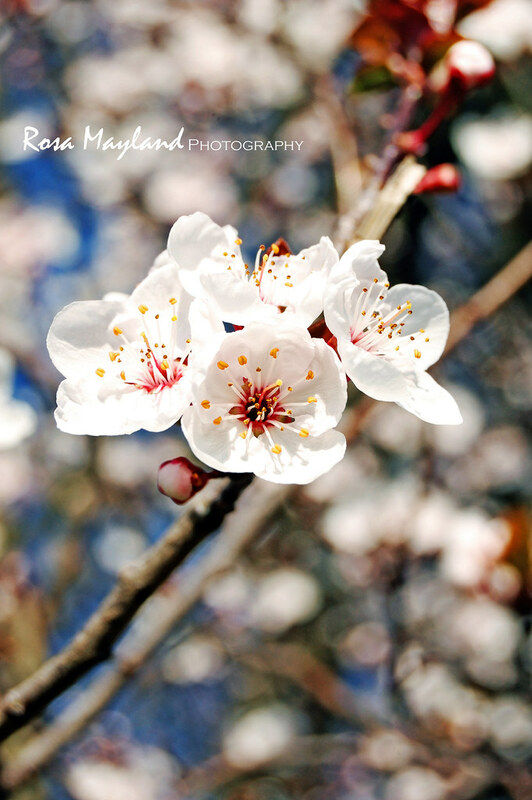 Beautiful spring blossom photos and the cake looks delicious too! Very heartfelt story you shared with us. These look delicious! I especially like the golden brown tops. My little girl would love these! I admire your postive thinking and these welsh cakea are divine! Very impressive that they aren't cooked in a stove, I wonder if a pizza stone could work! I have never heard of Welsh Cakes before, but I bet I'm a new convert! Delicious! Howdy Rosa, this is such interesting cake. I have bookmarked this. Thanks so much for sharing it. Happy Easter Day to you & your family too! Enjoy your day. mmm Welsh cakes, they look delicious and so do your pictures! Its amazing how food elicits memories- some pleasant and some not so pleasant. Its amazing how despite what all you went through, you have so much optimism and positivity in you. Incredible indeed. The Welsh Cakes sound very interesting and delicious. I think this post might have brought you a kind of relief, I think you came out of this all much stronger, and you will give love where needed as you were deprived of it yourself. You know we listen to the same music and in the darkest periods of my life, that music helped like a band-aid on a wound. Hi Rosa! I've never had or heard of Welsh Cake before but from the pictures and recipe, I know I'd enjoy it very much with my favorite tea! I'm in Japan now enjoying cherry blossoms everywhere - full blooms and everywhere is pink!! :-) I have been trying to take pictures of them but none of them look even close to your picture... your photos are breathtaking! Sorry to hear you had such a negative childhood Rosa. While my parents where certainly no saints I'm happy that it was never as bad as yours. Good thing too that you managed to cherish those few happy moments you had and these cakes sure look fantastic! Rosa-I too know how it is to have dysfunctional parent/parents. I do not speak with my mother and will not ever again. You are absolutely right, dwelling on the past and negative thoughts or memories will only bring you down. Look forward and towards a more positive life for ou and your family :) I love reading your gorgeous thoughts and writing. So inspirational! And these welly cakes are amazing!! They sound a little like English muffins, but they look way better with all those currants peeking out of them. Adorable receta me encanta ..para usted muchas bendiciones hay un mañana y Dios la acompañara siempre ,rogaré por su persona,abrazos hugs,hugs. 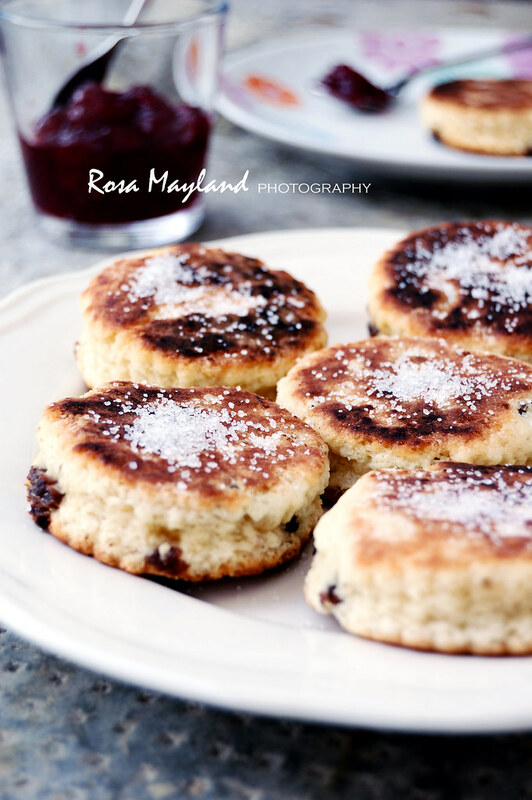 What gorgeous Welsh Cakes Rosa, everything you make looks so delicious. It's certainly amazing how food and memories are interlinked. I think you are right, dwelling on the past is never productive. Focus on the positive and looking forward. Oh, Rosa, I've sort of been there and completely understand *hugs*. You persevered and made a success of yourself with your many talents - not many do..you're very strong! With that said, I've seen loads of welsh cakes around the blogosphere, and I'm intrigued. Yours look beautiful. I like these with lemon curd. Yours are so much more perfect. Mine are always ugly but still tasty. My kids love popping them right into the toaster. These look so delicious! Beautiful pictures! Those Cakes look divine. And the blossoms pictures are so serene. ça ressemble à des scones et en tout cas c'est terriblement appétissant ! surtout le matin après le petit dèj carrément je regrette de ne pas en avoir eu ! These currant cakes look amazing. Never heard of them but I know I ll like them! Beautiful pictures of the flowers! your pictures are ever so stunning! I know without a doubt I could have at least 10 of these! They look delish, Rosa! I learned a lot from this post. I had no idea that welsh cakes weren't baked. It is also beautiful to read about recipes that are handed down from generation to generation (no matter how dysfunctional). Hello Rosa! I've never commented here before (I rarely comment anywhere - too shy :)) but I wanted to say that I loved your post. I have never thought of food in the ways you have shown here, though I too was brought into the fantastic world of food through hardship. My mother was an alcoholic (and recently passed away and is dearly missed) and because she was gone so often, sometimes 4-6 months at a time, I finally got fed up with my father and I eating hamburger helper every night. I decided to get my hands dirty and try my hand at... canned chili! And that slowly moved onto roasts. I was 16 at the time, I'm now 19 and even though those times, and this past year after my mother's death, have been difficult, food and most of all baking have been one of my clearest and most easily obtained joys. Thank you for the lovely recipe and the insights and inspiration! Encore une bien jolie recette que tu nous proposes. What a lovely batch of cakes and beautiful flowers. Your photos never cease to amaze, Rosa! Thanks for sharing your talents. Hugs. You are breaking a nasty cycle. Cheers to you for that. As always, you come up positive and beautiful and it always shows in your photographs and food. Sending love. You;re brave for sharing this with us...you must know the famous poem by Phillip Larkin? I love Welsh Cakes by the way, and I love the way you've photographed them. Great photos! And your Welsh Cakes look delicious! These look a right treat to serve at a ladies' tea. Will have to try making these soon. 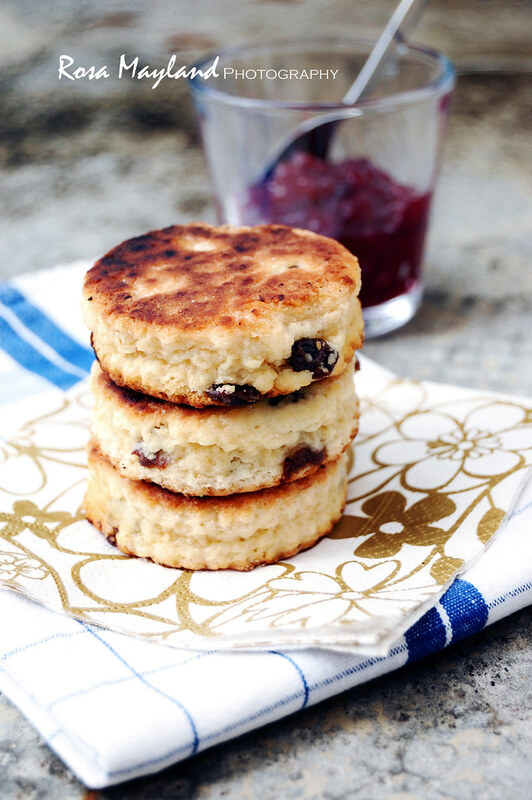 I love welsh cakes and these look so moreish and delish!! Thats pretty awesome that these cakes are cooked on the stove top...love to try these out! Beautiful recipe and amazing pictures! Love your blog, Rosa! Such a deep mixture of joy and sorrow, and you describe it perfectly. I think we all have some scars from our parents: yours are surely deeper and harsher than most, and yet it is great that you are able to find some good memories in that. I have fond memories of Welsh cakes as well, when I lived in Wales it was one of the few treats I enjoyed regularly, hot from the griddle at the food market. Thank you for this family recipe, I'll make them when the craving strikes. It is such a shame that a licence is not required to raise children. So sorry about your parents. You however are able to see the beauty in life, and I hope that brings you joy. These little cakes look and sound wonderful! J'en connais un à la maison qui devrait adorer ces scones Rosa. Ces gâteaux ressemblent à des scones, ils doivent etre délicieux! oh gosh, Rosa! These look absolutely delicious! My mouth waters by looking at the goodies. They seem approachable to make too. Can certainly understand why your stress just gone away after indulging in them. Thanks for the recipe. I'd absolutely give this Welsh Cake a try! I do not think I could ever resist these! and I like the sound of spice in them. They look so very lovely. I must try these out. Rosa, it is hard for me to imagine, knowing you as I do (which is only online) how your parents could resist such a charming person as yourself and treat you with such negativity. But I am glad that you are able to find a way in yourself to have good memories of the food you shared. Your Welsh cakes look so homey and comforting. Unfortunately you cannot choose your parents. Time heals all wounds! Best regards and thank you for this outstanding post!